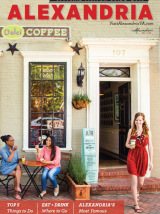 Alexandria, VA –The D.C. region’s Shop Small destination for independent boutiques, Alexandria, Virginia, invites shoppers to opt small and shop a local experience in a magical setting of holiday wonder. Reminiscent of a real-life Dickens Village complete with European flair, Alexandria&apos;s centuries-old brick-lined streets twinkle with holiday traditions. New this year is 116 King Holiday Pop-Up and expanded Random Acts of Holiday Cheer. The season includes an alternative Black Friday experience on November 25, 2016 with free parking and deals from nearly 50 boutiques, and Small Business Saturday on November 26, 2016 with in-store activities in which visitors can meet the makers and small business shakers and enjoy exclusive “Shop-Taste-Create” experiences. This holiday season, Alexandria welcomes Nantucket pop-up The Skinny Dip to King Street. The shop will feature emerging designers among 28 upscale fashion and lifestyle brands, including 13 brands under the umbrella of The Skinny Dip, a fashion collective founded by Sara Rossi and Taylor Ivey, as well as 15 additional brands with products ranging from women’s apparel and jewelry to men’s clothing, children’s items and other gifts. Sponsored by the Alexandria Economic Development Partnership, the boutique will introduce Alexandria and the larger D.C. community to fresh and emerging designers such as Ellsworth & Ivey, Beau & Ro, Bald Head Blues, Boast, and Hyla DeWitt Jewelry. Random Acts of Holiday Cheer will delight holiday shoppers with surprise giveaways from the Elf Prize Patrol, pop-up musical performances through the Alexandria Arts Alliance, and hands-on activities at the Mobile Art Lab. Due to the popularity of last year’s inaugural Random Acts of Holiday Cheer festivities, the fun will kick off this year on Small Business Saturday and expand every Saturday through Christmas Eve from 11 a.m.-3 p.m.
Alexandria’s alternative Black Friday experience features nearly 50 independent boutiques kicking off the holiday shopping season with one-of-a-kind deals on designer and coveted merchandise, including home décor, chic fashions, gourmet food, classic toys and gifts for dogs. The City of Alexandria is offering free parking at parking meters as a special incentive for shoppers on Black Friday so shoppers can visit more shops and bag even more bargains. Store offers vary, with some boutiques opening at 6 a.m. and offering special discounts throughout the day. To learn about participating stores and their offerings, visit VisitAlexandriaVA.com/blackfriday. After the shopping is done, stay for the popular City of Alexandria Annual Tree Lighting Ceremony at 6 p.m. on the historic Market Square. As the official kick-off to the holiday season in Alexandria, the ceremony includes live entertainment, a special visit from Santa Claus, and community caroling. As the D.C. region’s Shop Small headquarters, nearly 50 locally owned boutiques throughout Alexandria will participate in this year’s Small Business Saturday, offering special in-store activities around the “Shop-Taste-Create” theme. Random Acts of Holiday Cheer will delight shoppers on the streets of Old Town with surprise giveaways from the Elf Prize Patrol, plus pop-up musical performances through the Alexandria Arts Alliance, and hands-on activities at the Mobile Art Lab. An exclusive Shop Small in Alexandria bag will be distributed by the Elf Prize Patrol, in boutiques, and by the Alexandria Chamber of Commerce. The Chamber will distribute the exclusive bags filled with giveaways from its members with select bags containing gift cards. During the holidays, historic Old Town Alexandria is transformed into a winter wonderland reminiscent of a simpler time. Meet the makers and small business shakers at dozens of independent boutiques that welcome you with greenery at their doorsteps, offering everything from chic fashions and home décor to classic toys and gifts for dogs. With 80% of Alexandria boutiques and restaurants being independently owned, it is easy to get expert advice and products curated by local owners who are often on site. Since the launch of the city’s shop local holiday efforts seven years ago, Alexandria has seen an increase of patrons who are choosing to “Shop Small” on days that were historically dominated by big box stores or online sales. Named a Top Romantic City, a Top Dog-Friendly City, and with a dramatic history featured on the PBS series MERCY STREET, Alexandria is a nationally renowned waterfront destination just five miles from Washington, D.C. Old Town Alexandria is the Shop Small headquarters of the region, with dozens of independently owned boutiques and restaurants tucked in to 18th- and 19th-century architecture still intact from the city’s days as George Washington’s hometown. New restaurants ignite historic and off-the-beaten-path neighborhoods as the waterfront district evolves with new energy. Alexandria hums with a cosmopolitan feel and a walkable lifestyle—a welcoming weekend escape next to our nation’s capital.